Let’s face it…sometimes life is messy. For many home caretakers, there seems to be an endless demand for cleaning floors, windows, countertops, appliances, bathrooms, and the list goes on and on. On the bright side of things though, is that the payoff of living in a freshly cleaned home is a wonderful feeling! One chore that you may not have considered before, but can make a significant impact on the cleanliness and freshness of your surroundings, is cleaning the painted walls of your home. If you are interested in learning some new tricks that will make cleaning your painted walls an easier task, then continue reading below. We promise that the rewards will be quite pleasing for your environment. The walls of your home often receive a lot of abuse that most people do not notice until it is very obvious. 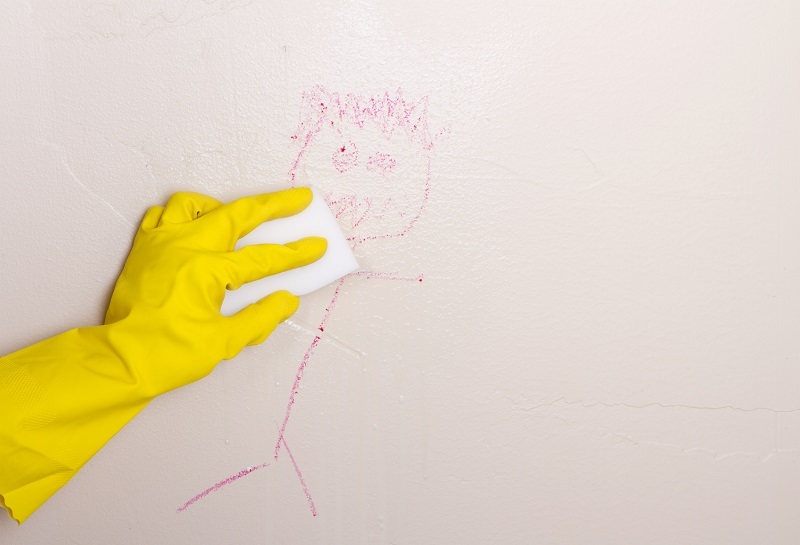 From people rubbing against the walls, to fingerprints, to food splashes, and to the collection of dirt and dust, there are many substances that can make a wall appear dirty. If you make an effort to clean the walls within your home on a regular basis, at least once a year, then you can maintain a cleanliness that will benefit everyone in your home. One way to clean painted walls, is to vacuum them with a soft-brush attachment of the vacuum cleaner. You may also use a long-handled dusting cloth or soft broom. Once you have cleared the walls of all loose dirt and dust, then you may use a soft, clean, sponge or rag to remove the more stubborn spots and stains. It is important to ensure that your sponge is completely clean, because you don’t want to accidentally make the wall spots worse than they already are, by transferring dirt from a dirty sponge onto the walls. Rub the walls very gently with the cleaning sponge, so you don’t accidentally remove the finish from the paint, as well. It is important to keep in mind that certain paint finishes are more durable than others. Glossy or semigloss finishes are the most durable, while flat, satin, or eggshell finish are a little more delicate. While cleaning your painted walls, consider what type of paint finish you have, and treat the less durable walls with a gentler cleaning technique.